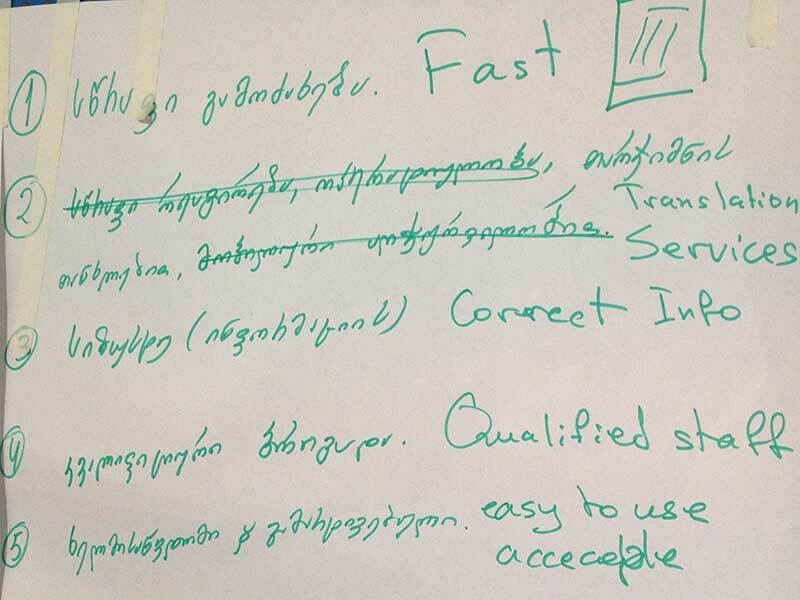 From 26th – 28th September, the UNDP Georgia organized a Design Thinking Workshop in the Multimedia Education Centre (MEC), Tbilisi, focused on providing optimum access to 112 emergency services for people with disabilities, particularly for the hearing and speech impaired. To this end, the workshop brought together relevant stakeholders – people with disabilities, 112 Emergency Services specialists and civil society organizations – in the highly creative environment of the MEC. The Creative Cooperative facilitated the workshop. 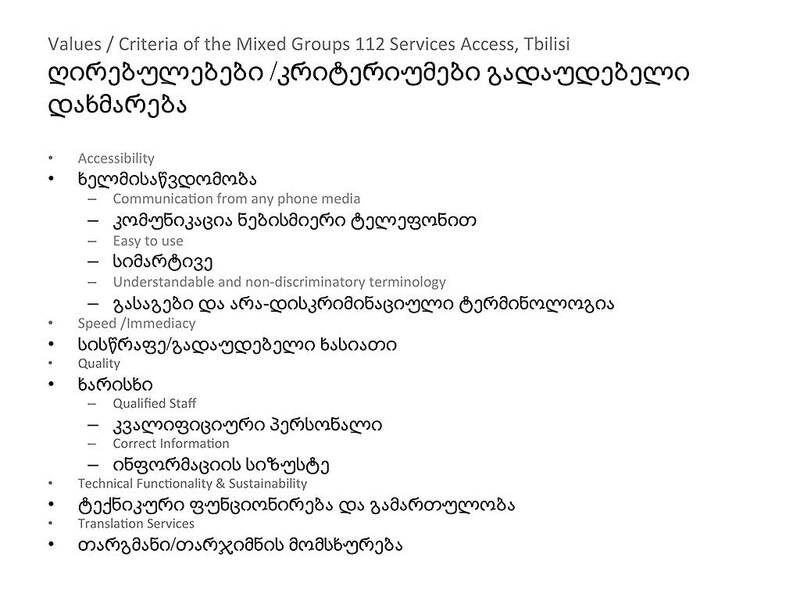 The Primary objective is granting access to persons with disabilities to emergency services in Georgia. 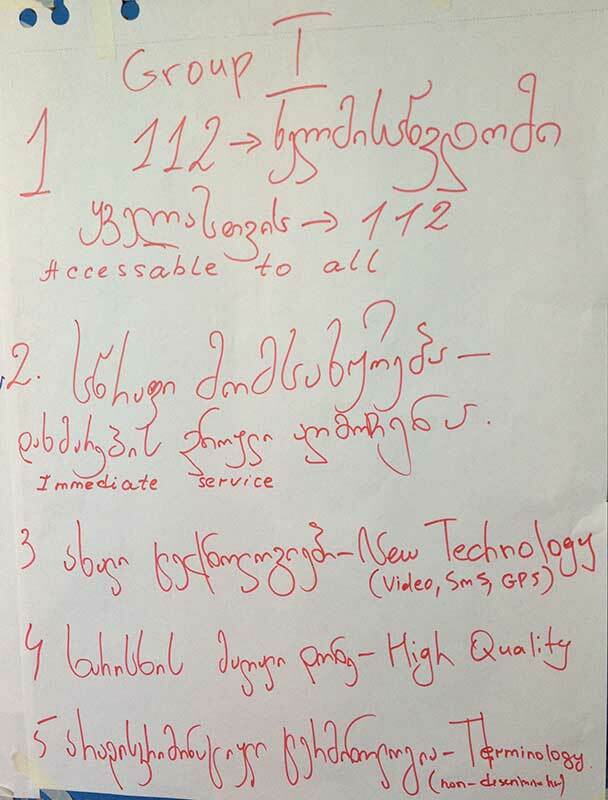 For that purpose, 112 shall develop new technical solutions for PwDs. Although the agency does have the IT capacity to maintain the solution, the present objective is to come up with the prototype of the actual process, together with the whole human interaction, starting from the initial call and ending with the final step – the requested assistance. This general introduction was followed by an “Ice breaker” exercise. Such an exercise is designed as an informal means of introducing all the participants to each other, promoting “out of the box” creativity, and thus leading naturally into innovative group work. In this case, we chose the “Fabulous Beasts” exercise, where each of the participants was asked to draw a picture of herself/himself as a fabulous beast, and to list the supernatural powers which she/he would possess. All of the participants then presented their individual “beasts” to the whole group. The participants were then introduced to the concept of Design Thinking, and “navigated” in advance through the design thinking process, on which they were about to embark. Subsequently, the participants formed Groups. The basis for the groups was an optimum mix of the various stakeholders, including disabled people, if necessary with interpeters, 112 Emergency service representatives, and government agencies. In total, four groups were formed, ranging from 3 to 5 participants in size. The first group exercise was the creation of “Value Ladders”. The Value Ladder is for the Creative Cooperative an essential part of the participatory creation and design process. 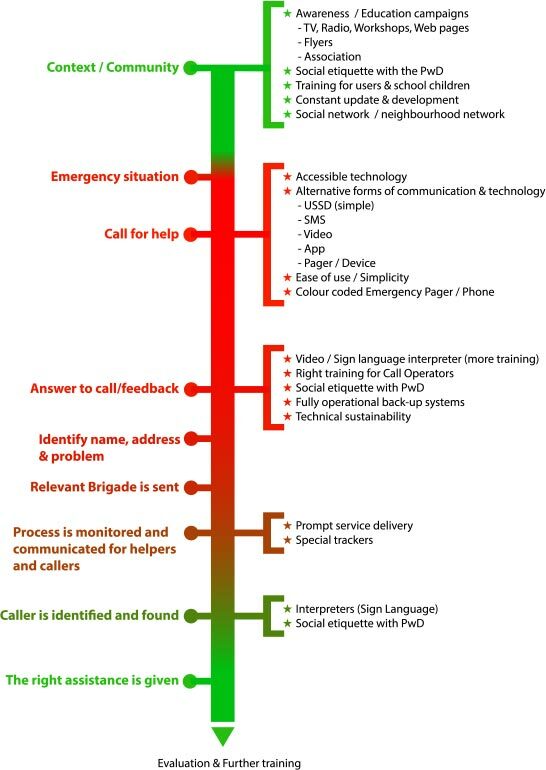 If people with very diverse perspectives and experience are going to work together towards a shared goal, the must share common values with regard to their creative aim, in this case, the creation of an optimum 112 Emergency Response System for disabled people, in this case especially for the speech and hearing impaired. The individual values of the individual team members with regard to optimum 112 Emergency Serviced delivery were combined and negotiated within the group until a final agreed “top” five values or criteria were attained. 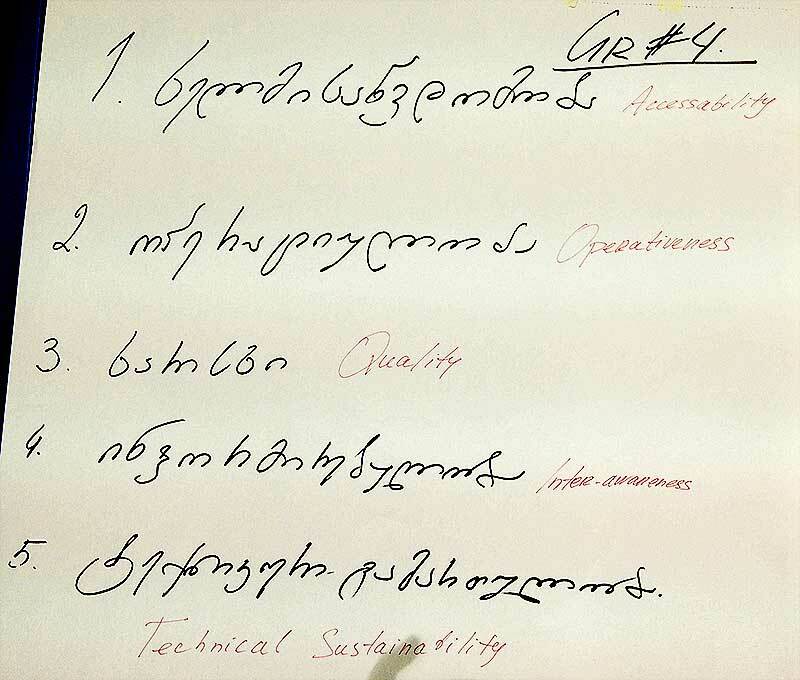 These values or criteria serve as a “touchstone” for the different groups to check back on the “authenticity” of their solutions during the creation process. Following the “Value Ladder” exercise, the groups then moved on to building the “Persona” of a character, which they would subsequently use in creating the narrative. This persona embodies their own experience and will eventually form the basis for the creation of their 112 Emergency Service proposals. 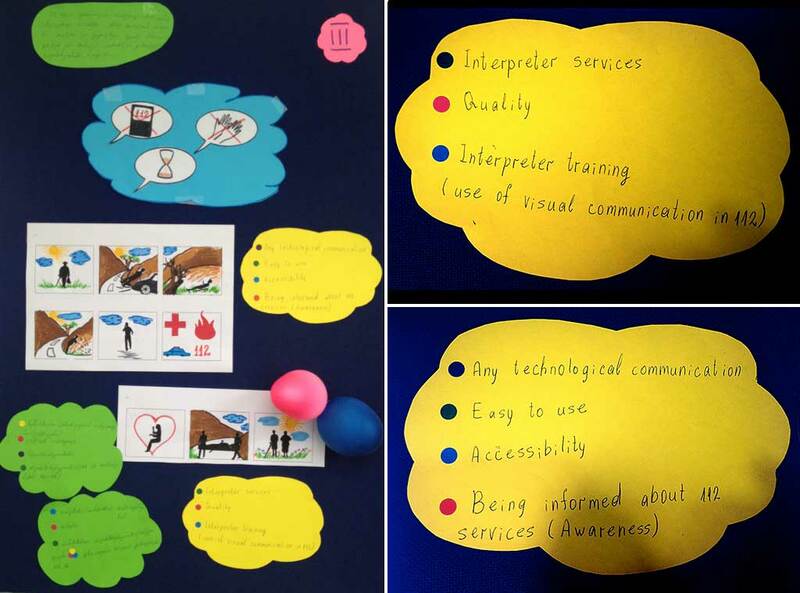 Equipped with their values and persona, the groups were then asked to build a Narrative to map the present situation of a 112 Emergency Service response to a need for assistance for a speech or hearing impaired person. For this exercise, the groups made use of the wooden story puzzle pieces. The ensuing stories were then presented on posters, displaying the potential inadequacies or weaknesses of the 112 Emergency Service response. It was emphasised that these technologies, however powerful, could also fail in certain situations. A really effective solution would be robust and flexible enough to master such a situation. The second day started with a presentation by Creative Cooperative of the nine steps within the 112 Emergency Services Call and Response process. Each of these steps represents a critical moment in the reponse. The time line of the Emergency Service answer and response process was also confirmed by the 112 experts among the participants. After the story boards had been created, the groups moved on to the final stage of their creative work: the making of the final presentation. In order to produce the presentation, the groups made use of all the available physical materials which had been provided for the workshop. All the groups demonstrated their commitment by working into the evening hours on Saturday. The final group presentations were made to representatives from the UNDP, the 112 Services, the Deaf Association, Government Agencies, and the general public. 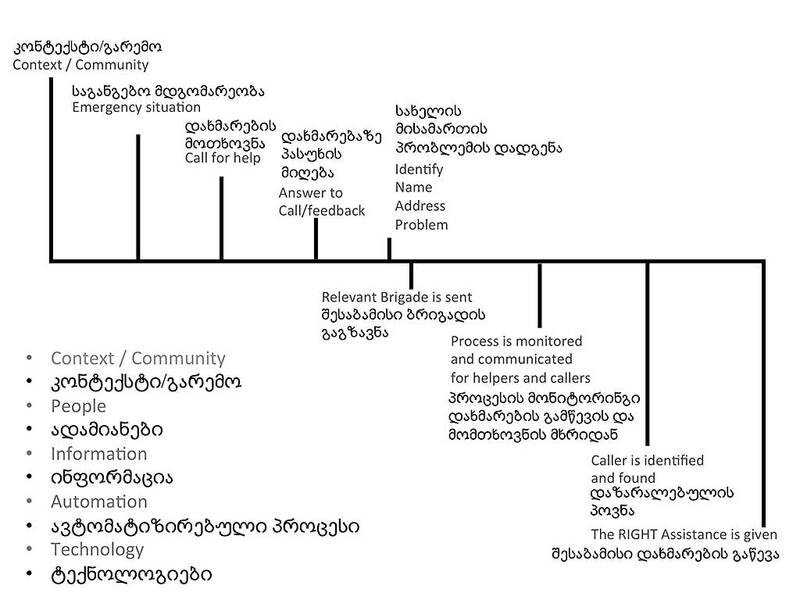 On the basis of group work, and recommendations, it was possible rapidly to create a Revised Service Process and Delivery Model for access to, and the delivery of the 112 Emergency Services in Georgia. The workshop continues to have a significant impact on the planning and delivery of Emergency Services in Georgia. 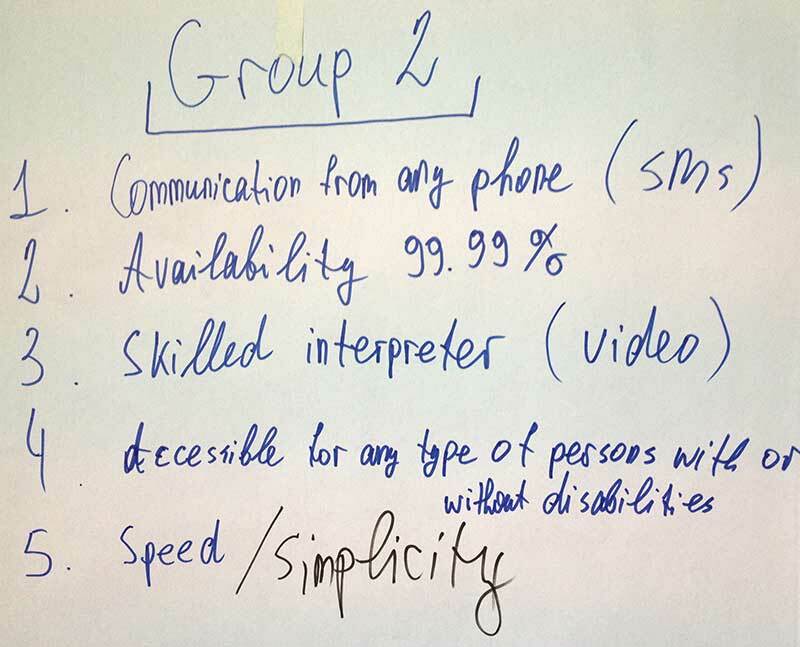 The 112 service organisation, on a senior management and operational level, is working closely with the workshop participants and their representatives to optimise the service for people with disabilities. For example, sign language translators have been hired. In addition, the results of the workshop are being used in development plans to improve service delivery for other margianalised groups. The commitment of all the participants, whether from the disabled community, the 112 Emergency Services, or other support agencies was outstanding. They were always at the event earlier than scheduled, they all remained until the end of the day, and they also sacrificed their week-end free time for participation in the workshop. This commitment and dedication was an important factor in the success of the workshop. In such a workshop with marginalized and vulnerable groups, it is critically important to gain their confidence and trust at an early stage. This is without doubt achieved by involving them actively in the collaboration, and “listening to their voice” as soon as possible in the process. The workshop toolkit provides excellent support. This, however, must be used flexibly and sensitively by the facilitator and tailored to the diverse needs, characters and priorities of the different workshop participants, the time available, and the achievable aims. This is particularly true for marginalized and vulnerable groups. The participants invested their time, energy, enthusiasm and passion in the workshop, and achieved considerable progress. We strongly encourage all the stakeholders to continue in the same spirit and with the same determination to collaborate further and build upon this initial success.